Home » 50% OFF ChiTAG Tickets + What is ChiTAG? 50% OFF ChiTAG Tickets + What is ChiTAG? **EDUCATORS & Librarians ARE FREE!!! Sign up here! Firefighters, police, miltary & veterans are FREE too!! Sign up here! 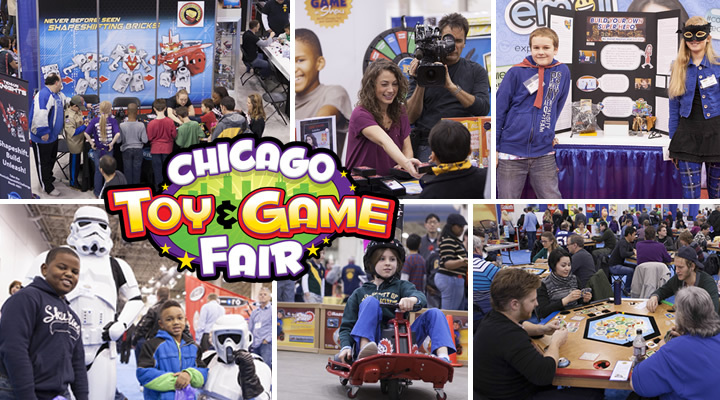 ChiTAG is North America’s Biggest Toy & Game Fair Open to Kids of All Ages! Come join the fun! Preview, play with and test the hottest toys and games from around the world your family, friends and other attendees like Legos playsets, Build or Boom, Shark Bite, Catch the Fox, Rummikub Twist, Fish Food, all new Doggie Doo, Greedy Granny, Ultra Dash, Marbleocity, Automoblox, Magformers, Tileblox, Clicformers, Ice Cool, King Frog, Reef Route, Woo-Hoo, Flower Fairies, Peter Rabbit Secret Garden, 8-Bit Art Mario and many more! Meet Toy and Game Inventors, take your photo with Star Wars characters and Princess Etch, enjoy live Stage Events with The Good Time Kids and Élan Dance Company – catch Ben’s Bubble Show, Mercy Magic, Contests, Giveaways, Ride-on Vehicles, Young Inventor Challenge, and so much more! Get your Chicago Toy & Game Week tickets HERE!